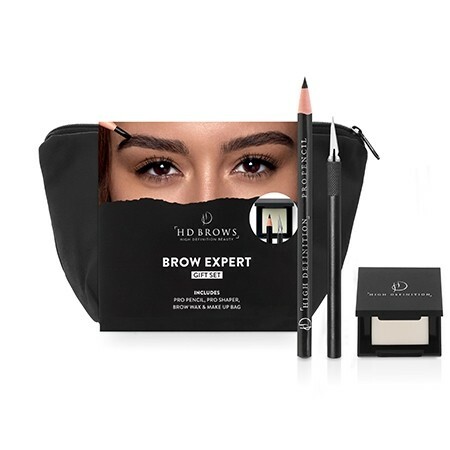 For those who are truly brow obsessed, this limited edition gift set has everything you need to maintain that fresh brow feeling between HD Brows appointments. Pro Pencil – No brow pencil compares to this cult classic. The precision tip is ideal for mimicking hairs that aren’t there with a completely natural finish. Pro Shaper – How does our Pro Pencil get its unique super fine tip? With the Pro Shaper! Brow Wax – Set brows in place all day with this clear wax. Perfect for creating a brushed up brow look. Housed in an exclusive ‘good brows, good mood, good day’ make up bag, it’s a brow lovers perfect Christmas gift. The universally flattering Pro Pencil means that this set is perfect for all hair colours and skin types. Sharpen your Pro Pencil to a precise tip (similar to the look of a flat head screwdriver) using the Pro Shaper. Using very light pressure, add hair strokes through the brow where required. Finally, set hairs in place using the Brow Wax.